The HMD Global launched the company’s latest Android One smartphones Nokia 8 Sirocco along with Nokia 7 Plus and Nokia 6 2018 that were introduced at the MWC 2018. It sports a 5.5-inch QHD pOLED display with glass body for wireless charging support. It is powered by Snapdragon 630 with Adreno 508 GPU and runs on Android 8.0 (Oreo). It has rear-mounted fingerprint sensor and comes with Face unlock feature. The company has also promised to offer latest Android security updates every month and also update to Android P.
It is certified water and Dust Resistant (IP67). It has dual rear camera the primary is 12 MP and the secondary is 13 MP with dual-tone flash, 2x optical zoom. On the front side it has 5 MP camera. It also has Pro Camera mode. It packs a 3260mAh battery with fast charging and Qi Wireless Charging. The mobile sports a 5.5-inch pOLED display, sculpted Corning Gorilla Glass 5 protection, 700 nits brightness with a resolution of 2560×1440 pixels. It is powered by Octa-Core Snapdragon 835 Mobile Platform with Adreno 540 GPU and runs on Android 8.0 (Oreo). The device comes with 6GB DDR4X RAM and 128GB (UFS 2.1) storage. It has dual rear camera the primary is 12 MP with 2L7 wide-angle lens, 1.4um pixel size, f/1.7 aperture, and the secondary is 13 MP with 3M3 Telephoto lens, 1.0um pixel size, f/2.6 aperture, dual-tone flash, 2x optical zoom. On the front side it has 5MP front-facing camera with 1.4um pixel size. The device supports 4G VoLTE, Wi-Fi 802.11ac (MIMO), Bluetooth 5.0, GPS/ GLONASS, USB Type-C 3.1 Gen 1, NFC. It has USB Type-C audio, 3 microphones. It has dedicated Dual SIM and Fingerprint sensor as well as Barometer. It comes with Face unlock feature as well. The mobile packs 3260mAh battery with fast charging, Qi Wireless Charging, it has a size measurement of 140.93 x 72.97 x 7.5 mm. The Nokia 8 Sirocco is priced at Rs. 49,999 and comes in Black color. It is available from 30th April and Pre-bookings starts from April 20th on Flipkart as well as Nokia mobile shop online. Airtel prepaid customers get 20GB additional data on each of the first 6 recharges of Rs 199 or Rs 349, postpaid customers can avail the additional 20GB per month on the Rs 399 or Rs 499 plan for 6 months. 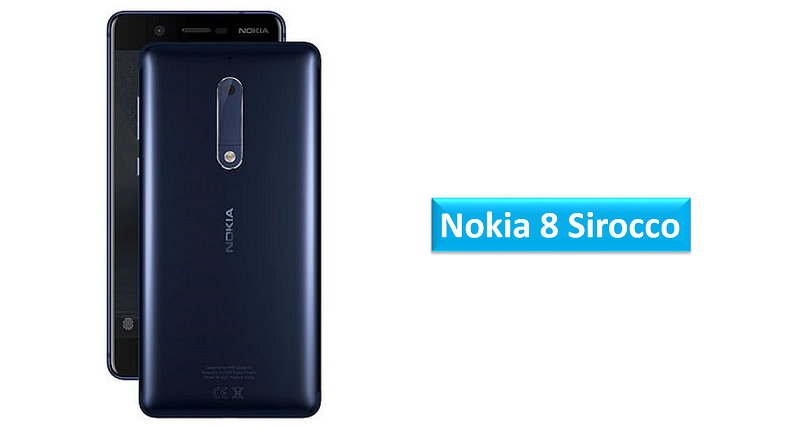 Share us your views on Nokia 8 Sirocco smartphone in the comments section below.